You are invited to the party of the year! Belles and Bow Ties is the title and theme of May River Montessori’s annual fundraiser, which is more of a fun night out than a (typical) fundraiser, according Emily Burden, co-owner of Gigi’s Boutique in Bluffton, who is co-chairing the event with Amanda Spencer, co-owner of and event planner for Spencer Special Events. “It is a special night out for friends and parents,” Burden said. In fact, the event has previously been voted Best Party by Bluffton Today’s Best of Bluffton. With a fashionable boutique owner and a creative event planner co-chairing the event, it is guaranteed to be nothing short of fabulous. After a year of planning, Burden and Spencer have created what they hope to be the most enjoyable event to date. After being greeted with a glass of champagne upon arrival, party guests will enjoy dinner and dancing; live music from Java, a band out of Charlotte, North Carolina; bourbon and beer tastings; cigars; live and silent auctions; and lots of surprises. Last year’s auction included 100-150 gift cards and over 100 tangible items including art, vacations, oyster tables, kid’s picnic tables, kayaks, and more. This year’s fundraiser will also feature a wine auction. An online auction housing most of the gift cards will be held March 11-15. A link to this auction can be found on the school’s Facebook page: facebook.com/mayriver.montessori or you can contact the school for details. As an added bonus, ticket purchases and auction items are tax deductible. From a Corner Perk coffee bar to desserts from The Cottage, it is “truly a community event where the community comes together to support May River Montessori,” said Sharon Haag, the school’s director. Not only local businesses but also the people of the community embrace the event. “We had non-parents attend last year who are coming back this year because they had so much fun,” Burden added. The maximum capacity of the Hampton Hall ballroom is 230, and this year Burden and Spencer hope to sell out the event. Sponsorship opportunities are available with a range of benefits, depending on the sponsorship level. All sponsorships include tickets to the event and a sign in front of the school, which is seen by all the parents in carpool line and passersby of the school. Each year, a number of businesses comment on how pleased they are with the effectiveness of the signs. Located at 60 Calhoun Street in Old Town Bluffton, a few blocks from the May River, is the hidden gem, May River Montessori. Now in its twenty-seventh year of operation, the school has 160 students ranging from two years old to sixth grade. The knowledgeable staff has over 200 years combined experience, with the majority of the staff at the school for over 15 years. “Through our teachers, with their longevity and experience, Montessori is really done correctly.” Haag said, who has been at May River Montessori for 16 years and has 30 years of Montessori experience. “We often hear from alumni how they have thrived after getting a good Montessori education,” she said. In fact, the standardized test scores from the students of May River Montessori are in the top tiers in the country for private schools. Burden is not only a May River Montessori parent but also the daughter of May River Montessori co-founder, Mary Vaux. “It is the school’s mission to keep the tuition affordable so more families can attend, and this [Belles and Bow Ties] is the biggest fundraiser of the year to help keep rates low,” Haag said, adding that the money raised at the event goes directly back to the children via operating costs of the school. 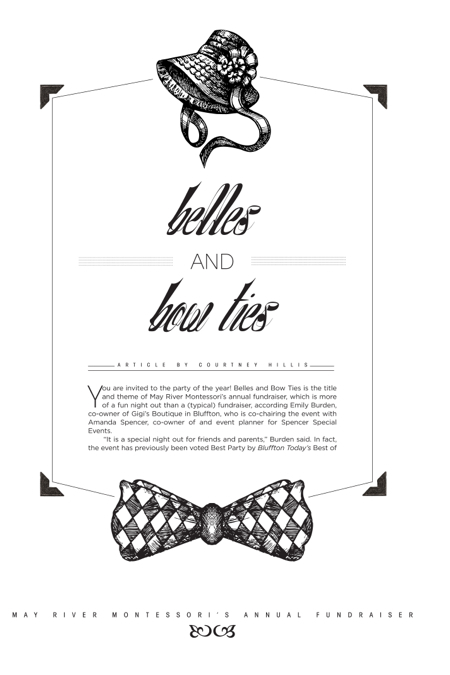 Belles and Bow Ties will be held March 20, 2015 from 6-11 p.m. at Hampton Hall Community Clubhouse. The attire is Bluffton Cocktail, which means women wear cocktail dresses and men dress more casual. Tickets are $75 per person and include dinner, drinks, live entertainment, live and silent auctions and more. Mark your calendars, buy your tickets, call the babysitter and do not miss Belles and Bow Ties, the party of year!  For more information about the school, please visit mayrivermontessori.com. To purchase tickets, become a sponsor, donate items for the auction or contact the school, call (843) 757-2312.